This take me home set is made from the finest soft cotton, perfect for delicate skin. The Fit for a little prince (or princess) set has a little bit of everything for the new arrival. 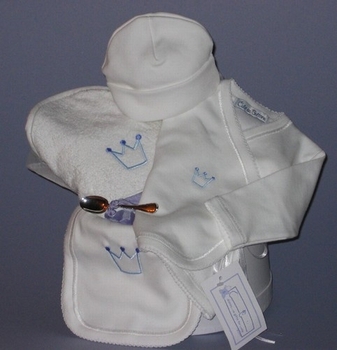 Set includes a white (3) piece kimono style take-me-home outfit, burp cloth and infant towel, all adorned with regal crown design (available in pink or blue).